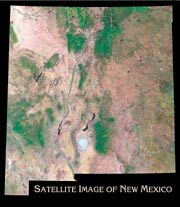 This spectacular composite LANDSAT image of New Mexico uses green for the infrared band making a more natural looking false-color image. Residents of New Mexico will recognize many of the state's unique landforms: the fertile valleys of the Rio Grande and Pecos River, Mount Taylor, Valle Grande, Elephant Butte Resrvior, White Sands, and the young lava flows near Grants and Carrizozo. For visitors, these and many more less distinctive features are labeled. This map is a fine companion to the Geologic Map of New Mexico which uses the same scale and projection. This price includes $5.00 extra shipping. Rolled map 47" x 54" -- requires extra shipping.